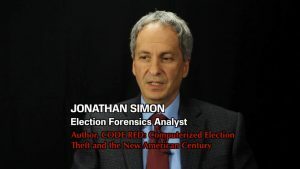 12/4/18 Meria with Jonathan Simon, Election Forensics Analyst, author of “Code Red, Computerized Elections and the War on American Democracy”. The 2018 elections; voting online? ask Marriott; cyber theft;Georgia, the poster boy for stolen elections; Stacey Abrams lawsuit, what’s it missing? Misinformation campaigns; 8 yrs for voter mistake? Why? Florida’s recount is a joke, bans hand counting of 99%; the Founders and the Senate; Electoral College; Wisconsin protests; vote on trump in Mid terms; Ocasio Cortez vs. the male millionaires; Paris protests vs. the US; Vote with your dollar; get out of the big banks; the Collier Brothers and lots more.